We offer to our honored patrons the first-class range of Khaitan Ceiling Fan. Furthermore, our patrons can avail this product from us at affordable rates. 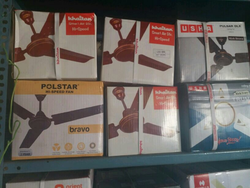 We are recognized trader, supplier, exporter and wholesaler of khaitan ceiling fans. Owing to its durability and efficiency, these fans are widely used in homes and offices. Our vendors use high-grade material and latest technology for the fabrication of these products. Moreover, these fans are thoroughly checked at our quality lab so as to offer the clients only quality-approved products. We are authorized dealer of ADPR Khaitan fan in Ludhiana.